Have you heard? Cancun and Playa del Carmen will be changing their time zone. 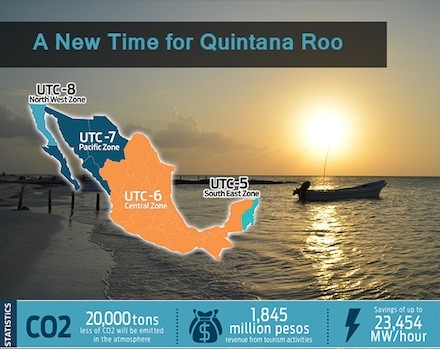 Effective February 1, 2015, certain locations in the state of Quintana Roo, which include popular tourist areas of Cancun, Playa del Carmen, and Tulum, will be moving their time an hour ahead in a new time zone known as the “Southeastern Time Zone”. February 1, at 2:00 a.m., clocks will be set an hour ahead in areas that are included in the new time zone. This change will match the current time as those locations positioned in the Eastern Standard Time Zone. Moving the time an hour forward will place these destinations in a permanent daylight savings time. Now your vacation days will be longer! The new Southeastern time zone will not participate in turning their clocks back an hour during the fall, when most other time zones make that change. Officials say that the new time zone will curb energy consumption, improve airline connectivity and will benefit the tourism sector by being more competitive with other destinations in the Caribbean, who are in the same time zone. So are you wondering how this affects you? Basically, it means that you can enjoy that one extra margarita, after dinner and not feel guilty for sleeping in an extra hour the next morning. This is good news for the late risers, since the sun will appear an hour later due to the time adjustment. You won’t be losing any daylight with this new time zone change. In fact, you will be gaining an hour of sunlight. Woo-hoo!